The paint, developed by engineers at the Nissan Technical Centre in the UK, is hydrophobic and oleophobic. That means it repels water and oil. That means the gunk and goo that normally sticks to your ride slides right off. It’s like wax, but better. 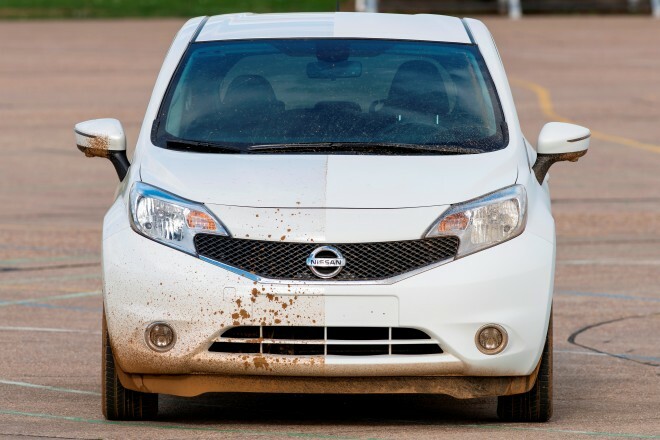 Nissan’s engineers have applied the finish, called Ultra-Ever Dry, to a Nissan Note and say it does a remarkable job repelling rain, spray, frost, sleet and standing water. If the video is to be believed, mud literally slides right off. There’s nothing new about hydrophobic or oleophobic coatings–Rust-Oleum offers a hydrophobic spray that works (mostly) as advertised, and the iPhone features an oleophobic coating to reduce fingerprints on its precious screen. Still, it’s new to cars, and Nissan will continue testing it. Nissan says it has no plans to offer the paint as standard equipment, but will consider making it an option.